Did you know that people who have spent time behind bars can experience “accelerated aging” so that the physiological age of some older prisoners is up to 15 years greater than their chronological age? While this may be caused by a host of related factors—including histories of unhealthy behaviors and inadequate healthcare—there is little doubt that the trauma and stress of the prison environment can have an impact on prisoners’ accelerated aging and deterioration of health. What’s more, state and federal prisons are now experiencing unprecedented levels of older inmates, which have significant implications for corrections budgets. Not only do older prisoners require more treatment and medical care than younger prisoners, their needs may also require more time and effort from the prison staff, such as when a staff member gives them medicine or monitors their daily chores. Staff may also need to provide more surveillance and protection to older prisoners, as they are more likely than younger prisoners to experience physical injuries and victimization. It’s no surprise, then, that the annual cost of incarcerating an individual age 50 and older has been estimated at $68,270, double the cost of a younger offender. This estimate equates to $16 billion a year spent on older inmates nationally, even though they make up less than 20 percent of the total prison population. To put that number into perspective, $16 billion is enough to put 170,000 people through a four-year college. As our new report shows, the growth of elderly prison populations is not expected to slow down anytime soon. 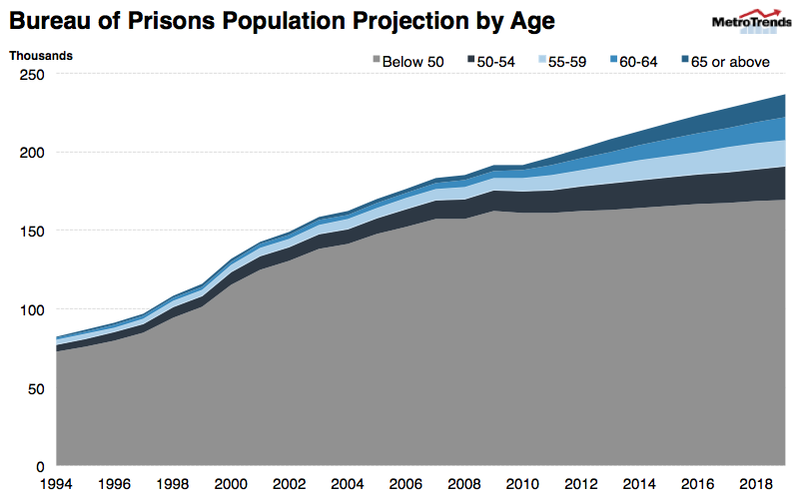 For the federal Bureau of Prisons (BOP)–the largest corrections system in the United States—we project that the proportion of BOP inmates age 49 and younger will only grow marginally over the next five years, while the proportion of those age 50 and older, especially those age 65 and older, will grow at an exceedingly fast rate. By these projections, older prisoners could make up nearly 28 percent of the BOP population by FY2019 – an increase of almost 10 percentage points compared with FY2011. Develop policies for all types of older prisoners. The current discussion about aging prisoners tends to focus on geriatric prisoners who are severely ill or dying. Correctional programs and policies for aging prisoners (such as the existing hospice care, palliative care, or compassionate release programs) should be extended to a broader population of older prisoners. Develop an easy-to-use assessment/screening tool. A set of guidelines for assessing the health of older prisoners would help correctional officers detect common geriatric symptoms (e.g., sensory impairment, functional impairment, incontinence, and cognitive impairment) as well as prison-based functional impairment (e.g., getting from cell to dining hall, climbing on/off bunk, hearing orders from staff, getting down on floor for alarms). A screening tool could also provide useful baseline information about the needs of aging prisoners and serve as an early intervention point for preventive care. Train correctional officers about aging and the needs of older prisoners. Training would also help staff identify older prisoners who need to be monitored for health and safety concerns. Consider expanding the use of preventive health care/dental care, early diagnosis, and early treatment among aging prisoners. These practices can help prisoners avoid more serious health problems and lead to savings in health care costs. They may only account for a fraction of the BOP population, but the costs of incarcerating older prisoners can be substantial. However, existing federal sentencing policy offers limited options for effectively addressing the needs of aging prisoners. Policymakers and lawmakers should devise options for better managing and treating a broader population of older prisoners to avoid serious health problems and hefty incarceration costs.